My original intention was to incorporate some cross-stitched designs into a sensory and memory quilt I made for my dad for one of his Christmas presents. As I creating that quilt, I chose to focus only on photos that he selected since they had personal significance and represented important people or experiences he had in his life. 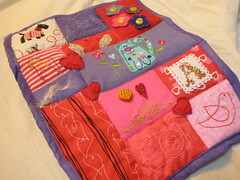 The other half of the squares of the quilt were different textures and colors of fabric. As he moves further along his journey with Alzheimer’s Disease, have these photos and a soft, multi-textured quilt provides comfort to him. I know this because every time I see him he shows me the quilt and tells me how much he likes it. I am so happy I made the quilt for him. It was one of most meaningful ways I’ve shared my creativity with someone else. 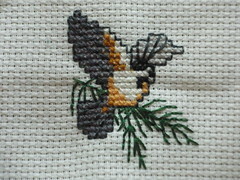 So…back to the chickadee cross-stitch design. Although it didn’t make it onto my father’s quilt, I’m thinking about how to incorporate it into something else. The chickadee reminds me of one of the many types of birds that visit the bird feeders. Hearing them chirp and call to one another at the feeder always makes me smile. After getting a seed or two, they quickly fly back to the big pine trees that around the house. I can hear them sing even in the trees. Such a tiny bird…but a loud, beautiful voice. The chickadee also reminds me of the love my father has for birds and how he enjoys watching them from his front window and by the kitchen. Both he and my mom tell me almost every time I talk with them how much they enjoy seeing the birds line up in a row as they wait for their turn at the feeder. I thought they were joking when they first told me this, but they aren’t. Truly, the birds line up in a row on the deck rail and wait their turn. When one flies away, they each take a couple of hops forward and wait some more until they get up to the feeder and can eat. Feeding and watching the birds brings so much joy. I’m so happy to be able to see so many different types of birds at the feeders throughout the year, but particularly during the winter when their vivid colors brighten the stark landscape. 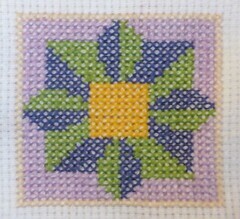 Completed another cross-stitch design as part of Art Every Day Month. This design is of two ladybugs. I’m not sure if I’m going to incorporate it into the journal quilt for the month or use it on handmade gift bags. One thing I do know is that it has been nice to work on projects that have been sitting in my “to do” bag for a long time. These little cross-stitching designs don’t take an awful lot of time…it’s just a matter of taking the time to do something creative. I finished the ladybug cross-stitch while rocking in a rocking chair at the local school library while Olivia was in a Brownies meeting. It was so quiet and peaceful – silent, really – in that library. To have even an hour of complete silence was refreshing. After a day of attending a caregiver support group meeting/workshop in the morning, homeschooling in the afternoon, and listening to the linoleum being installed in the mudroom (due to water/storm damage)…silence was something I truly needed. Such a simple thing…but one that is so difficult to get some days. 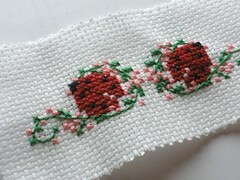 For “Art Every Day Month,” I finished a little cross-stitched pattern of two sheep and flowers. It’s small – only about 5 1/2″ x 1 1/2″. Now I need to figure out what I’m going to put it on. Have a variety of these small designs that I’ve wanted to do for some time now. This one reminds me of sheep I use to have. It was so nice to see them grazing in the pasture – especially in the spring when the grass was so green and some of the wildflowers were in bloom. She picked two 16-point stars with a moderate amount of folding. After I did some math to reduce the patterns by one-third, the paper size for each point was the smallest I’ve ever worked with. Needless say, it was a challenge (a good one, though). As a side note, if you look in the background of the picture, you’ll see that it is still snowing. It has been snowing almost non-stop since Friday night. Friday night-Saturday, it was the wet-heavy kind of snow. Sunday, it is has been the lighter, big-flake type of snow. By 4:30 p.m. on Sunday, the snow has stopped. Now it’s time to dig out from over a foot of snow! As part of Art Every Day Month (during November), I made a 2″x2″ cross-stitched design. It’s one I’ve wanted to try for some time. Didn’t know what it would look like since the design was in black and white. I’m not sure how I’m going to use this yet…maybe use it to embellish a gift bag or fabric book cover? I have a tote bag filled with baggies. In each baggie is a pattern, the embroidery floss needed to make the design, and Aida cloth (already cut into the proper size). I figure if I start with the small designs, like this one, I can make some significant progress during November in finishing projects that I haven’t had the time for…until now. This month I’m MAKING the time. It’s nice to re-visit an old hobby I use to enjoy doing. Perhaps that’s one of the side benefits of participating in Art Every Day Month. This is the second journal quilt that I’ve made in 2010. This represents things and people who I love – both who are living and have passed on. I chose the colors of purple, pink, and red for 2 reasons: (1) they are commonly seen around Valentine’s Day and (2) they represent one of my favorite colors (purple), Sophia’s favorite color (pink), and one of Olivia’s favrotie colors (red). The size of this quilt is approximately 9×12 inches. The backing is purple and wraps around the front for the edging. With the exception of the fabric that the cat is on (which is knit), it is all cotton fabric. I won’t be including knit fabric in a quilt anytime soon. It definitely was too challenging to work with and made the side of the quilt uneven. My skill level with quilting isn’t high enough to know how to work with knit and cottons together.